JENNI BAXTER was born in Kuruman and grew up in Salt Rock, South Africa. She worked as a TV and political researcher and journalist until 1990, when she moved to London and profiled movie stars and tackled British teen angst for London Weekend Television and Just 17. In 1998 she married a South African and they moved to Australia, where they live on the Gold Coast with their three daughters and have a web design company, www.bluex2.com. Jenni's happiest when drinking lattes, reading glossy magazines and doing pro bono work for AWEC - an Afghan women's charity. TED BOTHA was born in New York and grew up in the United States, Japan and Pretoria. He worked as a journalist and then went travelling through Africa, which resulted in the book Apartheid in my Rucksack. He moved to New York in 1996 and freelances for publications like the New York Times and Condé Nast Traveler. His book Mongo, Adventures in Trash, about the people in New York City who collect the valuable things that others throw away, was recently published by Bloomsbury. You can read more about him at www.tedbotha.com, which was designed by Jenni Baxter (see above). 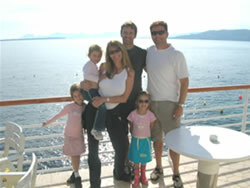 Image above: Author Jenni Baxter with her family and co-author, Ted Botha, during their first meeting, which took place in France after they had written 'The Expat Confessions' via emails to each other. With Baxter and Botha are, left to right, Cassie, Tara, Jade and Jenni's husband, Tony (wearing sunglasses).